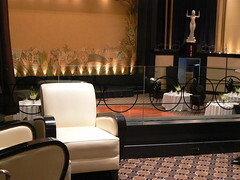 The Criterion Hotel is the oldest hotel in Perth with the original licence dating from 1840. 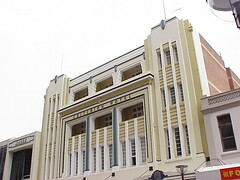 Obviously at some point the facade was redesigned in Art Deco style and it presents a wonderful frontage along Hay Street. 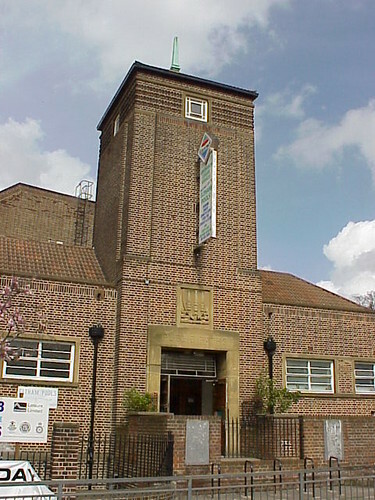 The public baths in Eltham in South-East London were built in 1939 but with the redevelopment of Eltham Centre in incorporating a new swimming pool rendered it surplus to requirements. The site was sold in January 2008 for £4m and since then I beleive the building has been demolished. In the mid 19th century Henry Lomb loaned his friend John Bausch some money to help out the optical shop Bausch was operating in Rochester, NY. After a short time he became his business partner and together they formed the company Bausch & Lomb. 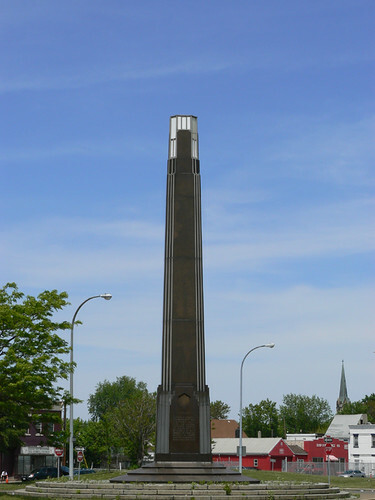 Lomb died in 1908 after serving the Rochester community as a public benefactor and in the 1930s a memorial was erected to his memory. 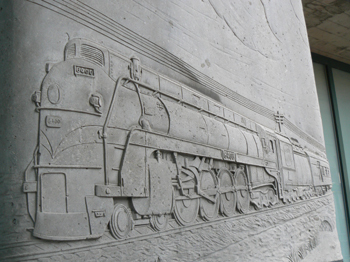 It was designed by Walter H Cassebeer from black ganite and stands 48 feet tall. I saw a lot of churches on my recent trip to Montreal which no doubt will make an appearance here at some time in the future but today I thought I'd stay closer to home. This is Our Lady of Good Counsel in the Melbourne suburb of Deepdene. 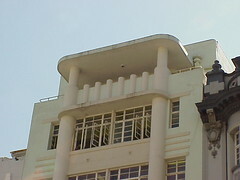 According to Robin Grow in his book Melbourne Art Deco, it was designed by Lionel San Miguel and constructed after WWII. I like the way that simple decoration has been incorporated using partially projected or recessed bricks and the contrast between the cream bricks and the white of the cross and the decoration on the roofline. 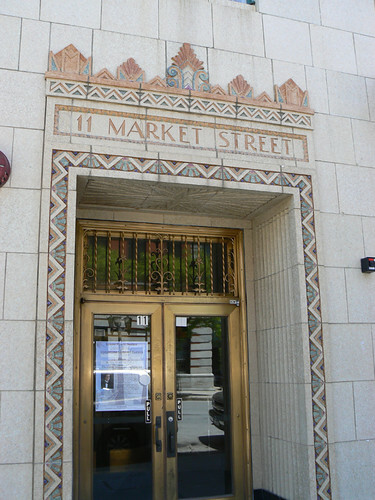 A fine Art Deco building in Poughkeepsie. 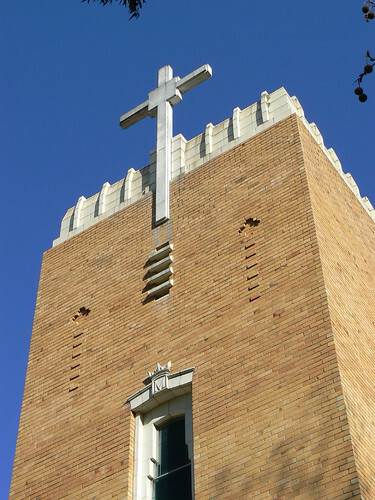 It was built in 1932 and is currently owned by the Reformed Dutch Church of Poughkeepsie from which it gets the name Church Building although it is occupied by a cafe and various offices. 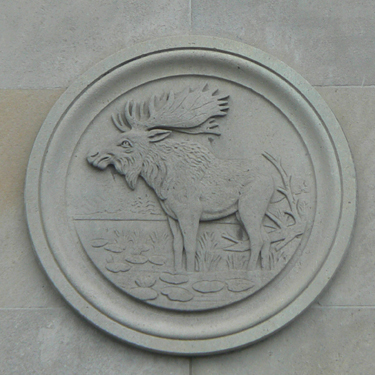 Yesterday I wrote about the 1939 former Postal Delivery Building which was incorporated into the Air Canada Centre where the Toronto Maple Leafs Ice Hockey team, the Toronto Raptors Basketball team and the Toronto Rock Lacrosse team play. 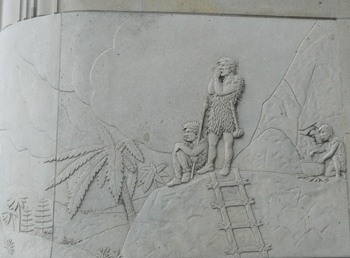 On eof the best parts of the old building that has been preserved is a series of reliefs depicting the history of human communication. I love the way many of the panels curve around the corners of the building. 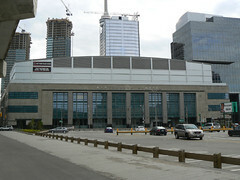 In the early 1990s, the former Postal Delivery Building in Toronto was earmarked for demolition but somewhere along the line the south and east walls were retained and incorporated into the Air Canada Centre, the home of the Toronto Maple Leafs Ice Hockey team, Toronto Raptors Basketball team and Toronto Rock Lacrosse team. 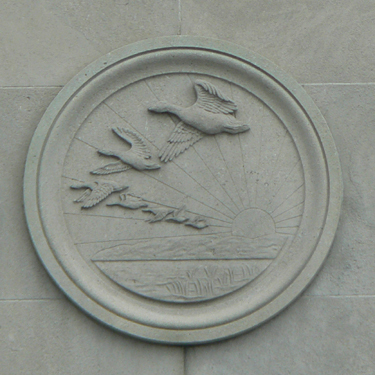 The Postal Delivery Building was commissioned by the Public Works Department in 1938 and the design by Charles Brommall Dolphin was completed between 1939 and 1941. With the development of the sports centre around the older building, the original footprint has been respected and maintained to some extent. 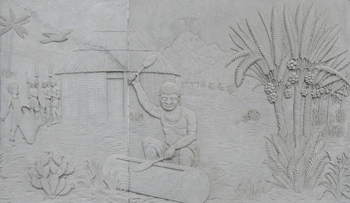 A display on the wall inside the new centre provides a history of the building including some elements that had to be removed when the rest of the building had been demolished. 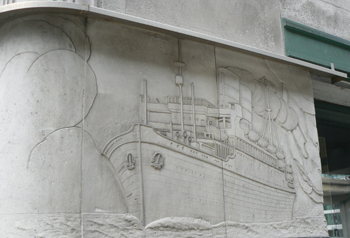 On display is the metalwork from above the original employees entrance which incorporates a dolphin in reference to the architect. 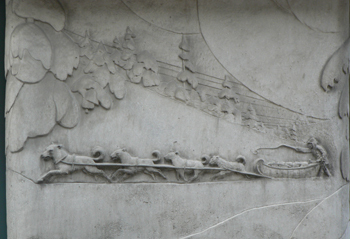 The former Postal Delivery Building retains a lot of the original decoration including a frieze of beavers and maple leafs (leaves) around the roofline. 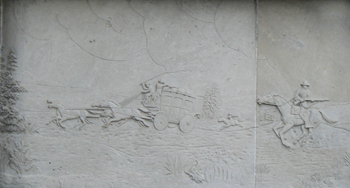 However, the best part of the building is the series of reliefs at street level depicting the history of human communication but I'll leave those to Part II of this post. Sometimes when you take a wrong turn in a strange city it can work to your advantage. 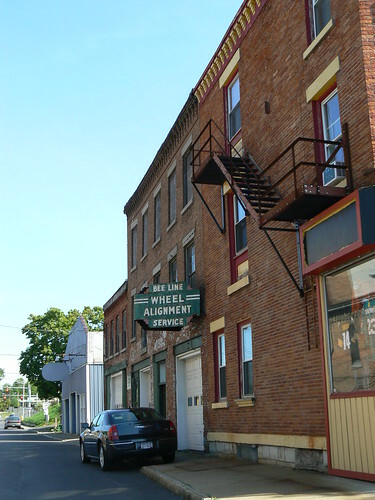 When we took a wrong turn in Auburn, NY I saw the sign for Bee Line Wheel Alignment down a side street so when we did a U-turn I was ready with my camera and snapped this photo. J Kitchen & Sons have been operating in Port Melbourne since the 1850s making such products as Velvet Soap and Electrine Candles from the tallow and other animal fats from the nearby slaughter yards. In recent decades the company has become Kitchen & Lever then Unilever and most recently Unichema. But back in the second half of the 1920s, into the 1930s, the company produced 'a journal of interest to all employees of J Kitchen & Son Pty Ltd throughout Australia' called Advance. The Port Melbourne Historical & Preservation Society (PMHPS) have several editions in their collection and they give an interesting insight into an established family company in the 1920s. Of most interest to me is Advance Vol 2 No 7 from July 1925 where their new Administration Offices in Ingles Street, Port Melbourne are described. 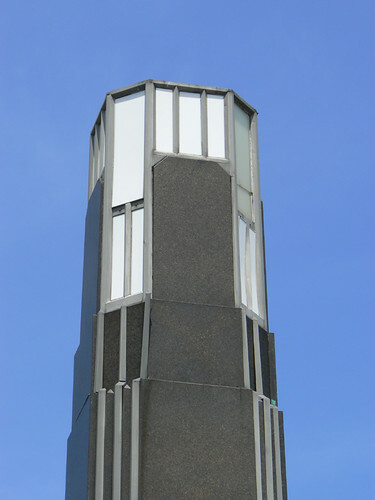 The article includes a picture of the 'imposing main entrance' which is stepped back from the street with a lamp on either side of the doorway and a view of the three storey office building itself. The article goes on to say '... the firm may well claim to have built one of the most up-to-date block of offices in the Commonwealth, combining loftiness, dignity and stability'. 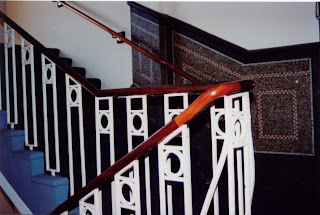 Inside the main entrance the vestibule has a 'mosaic floor in a shining pattern, having the monogram of J Kitchen & Sons worked into the centre". In May 1996 I visited this building and took some photos of the interior which are now also part of the PMHPS Collection. I didn't notice the mosaic in the vestibule but the article also mentions a staircase finished in a similiar style which I did photograph. 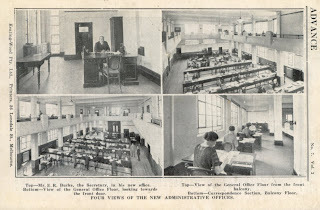 The main office occupied most of the ground floor with offices for Directors, the Secretary's Department, Advertising Department and Branch Inspector on the first floor. 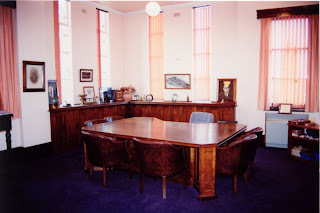 There was also a large boardroom on this floor. 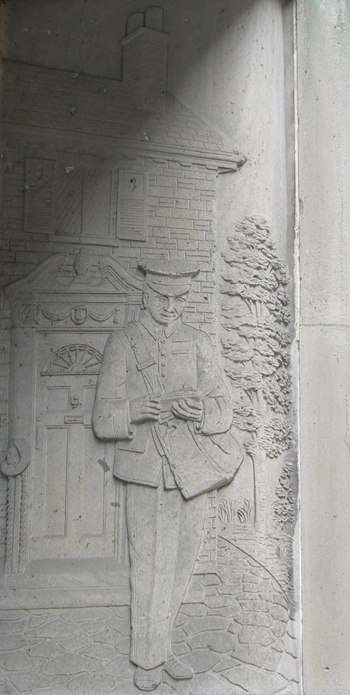 The offices 'open onto a balcony overlooking the ground floor'. 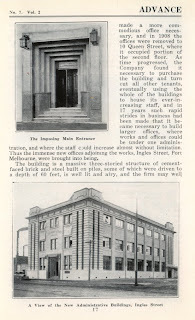 The back page of Advance included these four views of the interior of the office building. 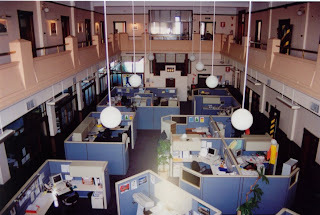 My photos from 1996 show the main office from the balcony and the then CEO's office. Interior fittings were of the highest order with doors built of 'polished maple and plate glass'. The second floor contained a 'spacious hall for social purposes designed to accomodate 700 people' with a kauri dance floor. 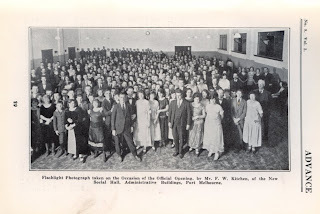 The following edition of Advance in October 1925 included this photo of the opening of the Social Hall. The company Social Club appears to have been very active with a library containing over 600 volumes, a tennis club, cricket club and football club who on the King's Birthday took on another great Port Melbourne company, the biscuit-makers Swallow and Ariel, at the Port Melbourne football ground. The Social Club also put on a Christmas Tree where in 1926 nearly 400 local children each received a toy from Father Christmas. 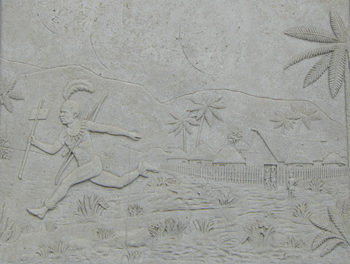 There were also dances, smoke nights, table tennis and picnic excursions. 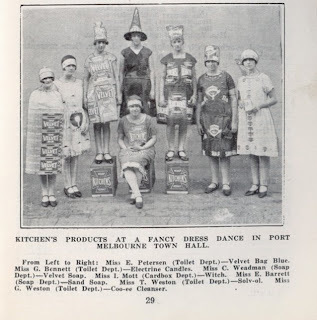 And, as this fabulous photo from the Advance of November 1928 shows, a fancy dress dance at Port Melbourne Town Hall. Here some of the girls employed at the factory are dressed up as Kitchen's products including Miss G Bennett (Toilet Dept) as Electrine Candles (2nd from left), Miss C Weadman (Soap Dept) as Velvet Soap (3rd from left), Miss T Weston (Toilet Dept) as Solv-ol (2nd from right) and Miss G Weston (Toilet Dept) as Coo-ee Cleanser (extreme right). 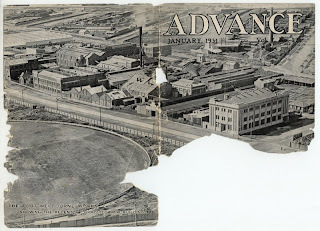 An aerial photo from the (ripped) cover of the January 1931 edition of Advance shows the extent of Kitchen's premises in Ingles Street and the proximity to the football ground. 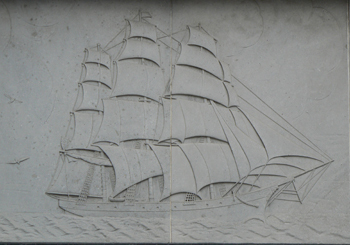 It is such a great image and easily recognisable to anyone from Port so I had to include it. 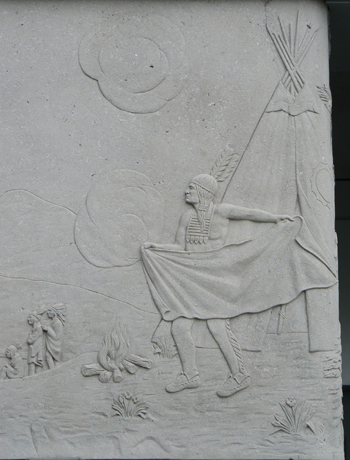 But the photo is interesting because there is something that current Port residents would not recognise. 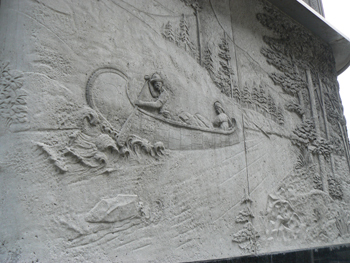 It shows Quinn St running along side the Administration Building. In 1923 J Kitchen & Sons requested Port Melbourne Council to reduce the width of Quinn St by 33 feet to allow the company to expand their works and therefore employee more Port Melbourne residents. At the time Quinn St was 99 feet wide, unmade and little used so Council agreed to the request with the Town Clerk saying that the company would need to buy the 33 feet wide strip of land. Over a decade later, Reports from October 1937 in the local newspaper, The Record, indicate that Council rescinded a motion from July that year allowing J Kitchen and Sons to take over remaining 66 feet of Quinn St. The motion was rescinded on issues relating to the cost of construction and the land value allowing Council to enter fresh negotiations. No doubt these further negotiations were successful as today there is no obvious sign that Quinn St ever existed. The Administration building has been empty for several years even though Unichema still operate from the Port Melbourne site. 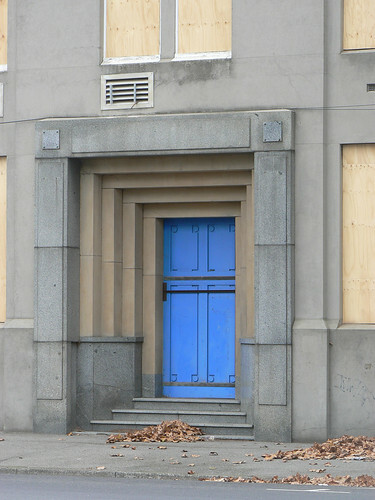 The imposing entrance has been bolted shut and leaves now gather where workers and important visitors once passed. 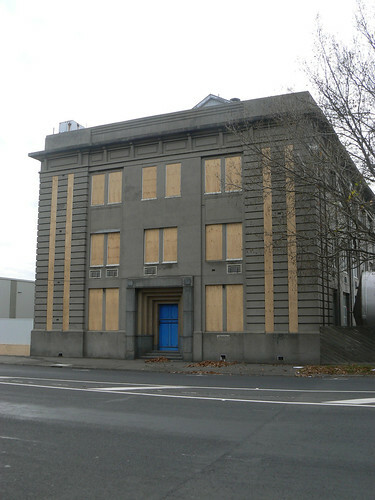 And just this week I noticed that all the windows along the Ingles Street frontage have been boarded up. I hope this is a sign of preservation, revitialisation and reuse but I fear the building has a more sinister fate. 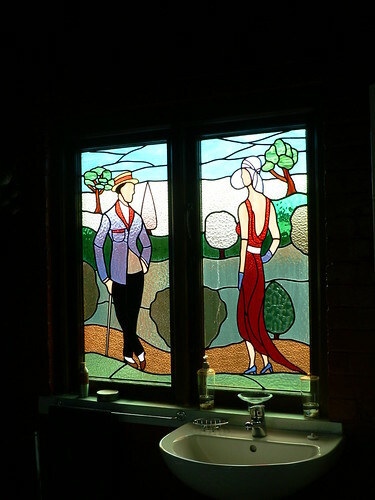 These leadlight windows are in the Moyola Guest House in Ranfurly, New Zealand. According to their website, the house was built in 1931 by a family that had come from the Moyola Estate in Northern Ireland. I doubt the windows are original but they are very stylish. 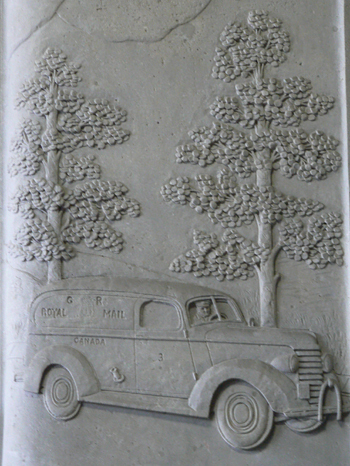 Moyola is run by Edna McAtamney, the driving force behind Rural Art Deco in Ranfurly and David McAtamney who is described as a Farmer-Opera singer. No doubt they are interesting hosts. Auburn, in up-state New York, has this wonderful streamline diner ... in fact a dinerant ... more than a diner but not quite a restaurant (? ), I don't know. 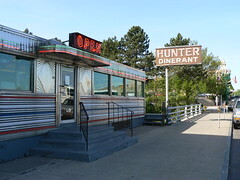 I stuck my head inside and it looked exactly as I would expect a diner to look and I wish I'd had time to have a late breakfast and sample some of the atmosphere but Rochester and Buffalo were calling and we had to get back onto the interstate and onto the next town. The Eglinton Theatre designed by Kaplan and Sprachman opened in 1936 but like so many beautiful Art Deco cinemas it could not survive the onslaughts of television, videos and dvds. 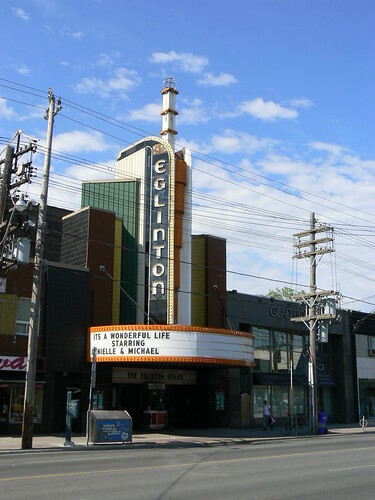 Today it operates as The Eglinton Grand, a reception centre. The raked seating has been removed and the floor levels in the stalls and balcony areas levelled off providing a large area for tables with overlooking bar areas. 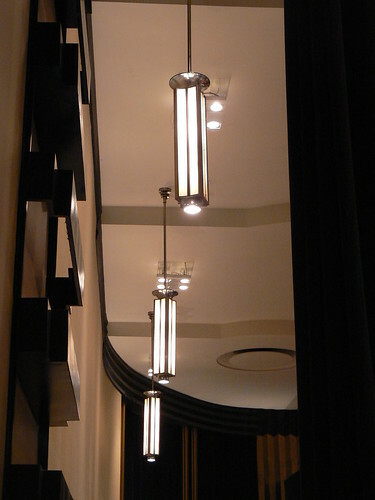 Many of the original features have been retained inside the former cinema including these stunning pendant lights in the main auditorium. 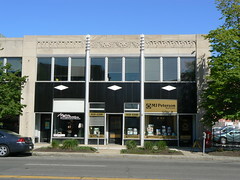 The Buffalo Design Collaborative occupy this Art Deco building on Buffalo's Delaware Avenue. 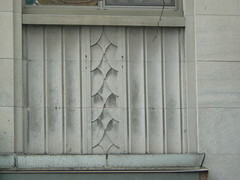 The building dates from 1930 and was designed by Duane Lyman. While taking these photos we attracted the attention of Jake Schneider, from Architecture Firm and Design Collaborative member Schneider Design, who invited us into the building and gave us an impromptu tour. 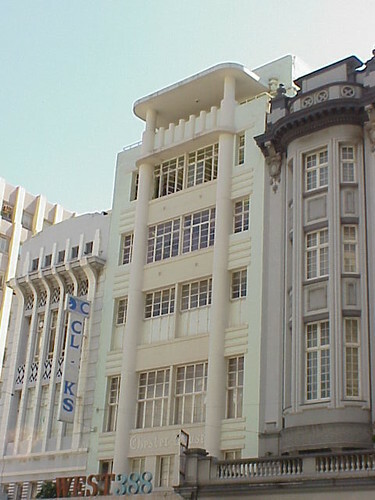 Jake was obviously proud of the building and his efforts to preserve it and make it suitable for 21st Century requirements while preserving many of the original art deco features including the terrazzo floor on the second storey. 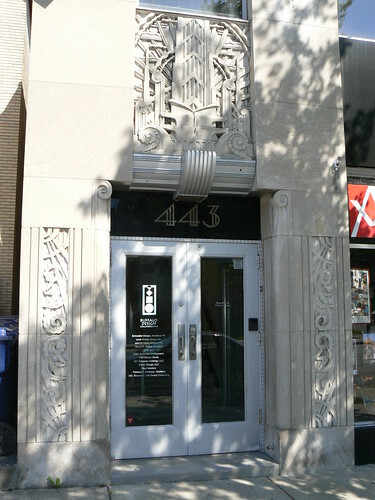 My favourite part of the building was the main doorway at 443 Delaware Ave which is surrounded by an array of geometric reliefs. 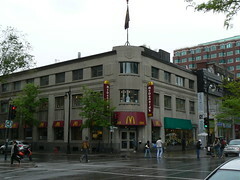 I've written previously about the most beautiful and the second most beautiful McDonald's in the world and was pleased to see another building being reused as a Macca's Restaurant. 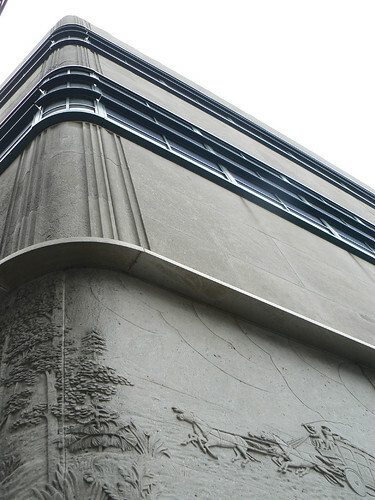 This is in Rue Sainte-Catherine in Montreal and has some nice deco details. The sight of the New Yorker Hotel on the skyline drew me like a beacon to one of NYC's Art Deco gems but when I got there I found this modest little building across the road at 488 Eighth Avenue. 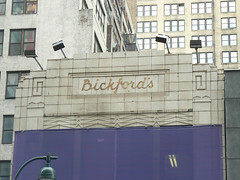 The name Bickford's can be seen clearly in a cartouche below the stepped roofline of the building surrounded by Art Deco chevrons and grecian design elements. 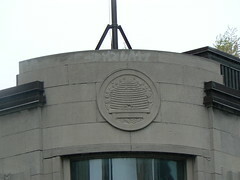 An internet search reveals a photo of the street level facade from the early 1940s when the building housed a Bickford's cafeteria and an article from the New York Times from 2000 entitled Breakfast at Bickford's prompted by this very building. 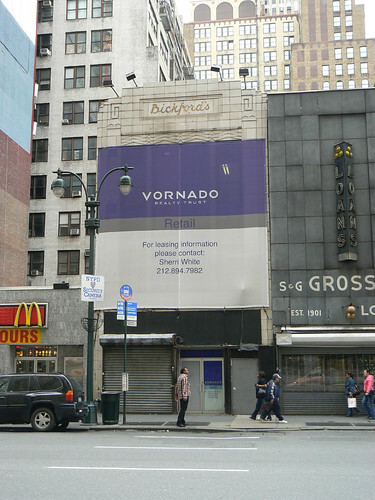 Both items are reproduced on www.plazaview.com, a financial forecasting website setup by Jeffrey S Bickford, a descendent of Samuel Bickford the founder of a chain of restaurants and cafeterias bearing the Bickford name which at one time had 48 branches all over New York dwindling to just 2 in 1980 when the name vanished from the New York streets. 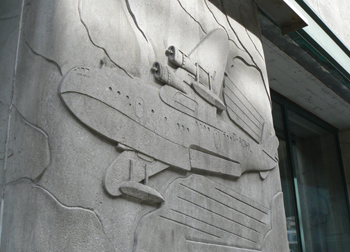 The article explains that the Bickford name returned when a metal facade was removed from an Adult Entertainment Centre. Now, in the summer of 2009, the building is vacant, seeking a retail tenant. Hopefully a sympathetic business can see the potential in this building and keep the Bickford name on Eighth Avenue opposite it's grand deco neighbour. 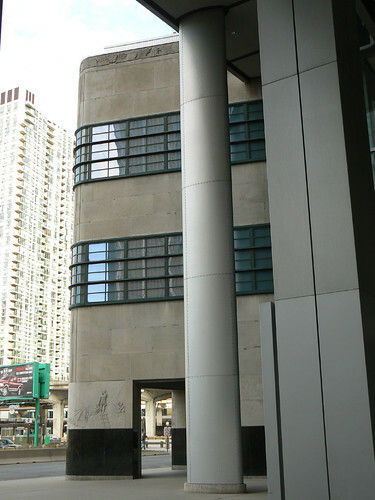 Chester House, dating from 1935, was designed by Cowin, Powers and Ellis. The metal framed windows and horizontal spandrels provide contribute to a very interesting facade. However the rounded columns stretching the full height of the building to the open balcony on the top floor really emphasise the vertical nature of the building.